When it comes to the breakup of a marriage, one of the hardest decisions involved is not one that either of the divorcing spouses has to make. No, it is one that the family and friends of the divorcing couple have to consider, or what I call, “The choosing of sides.” The husband’s or the wife’s. For some, it can be a painful decision to make, for others, maybe not. All the same, losing the family you’ve come to think of as your own, can be one of the saddest outcomes of a marriage gone wrong. It’s a problem that can break your heart all over again. Which is why I love my Aunt Elaine so much (who’s technically not my aunt but technicalities don’t matter much to me). 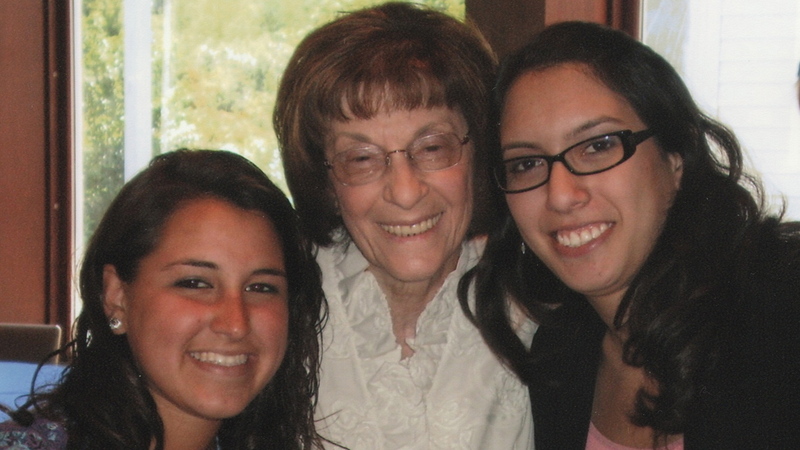 Aunt Elaine, with the two Sarah's. Luckily for me, I have been able to stay close to a few of the family on my ex’s side. After all, just because the marriage is over doesn’t mean it has to be the end of a relationship with all of the relations. I am still in touch with my ex’s sister–we sometimes catch up on the phone. But I’m closest to Aunt Elaine. She’s my ex’s aunt, really, and the youngest sister of my ex-father-in-law. She’s also been through divorce herself–years ago, when divorce was still frowned upon. Which makes her part of a group I call the “50 Percenters.” It also makes her rather empathetic to a divorced woman like myself. She has many interests: She’s a big Yankees fan and counts Joe DiMaggio and Phil Rizzuto among her favorites. Never misses a game. She also loves Frank Sinatra and has an extensive collection of his albums. 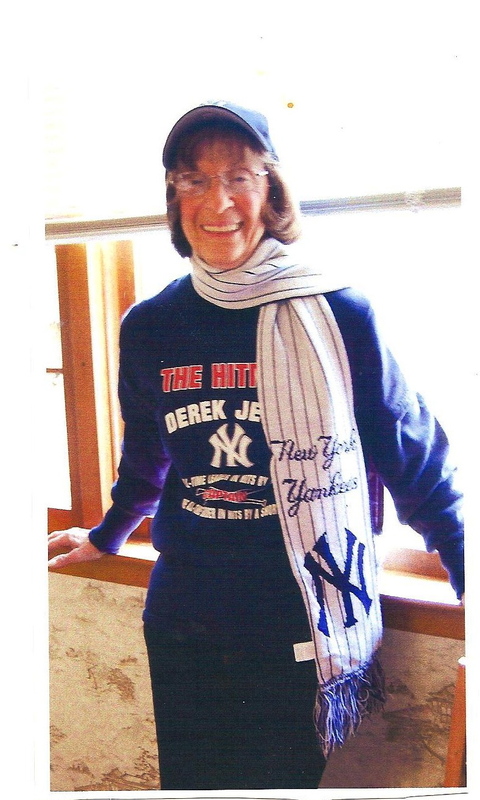 Aunt Elaine--Number One Yankees fan! She’s the Pickle Queen. Having worked years and years for a pickle company, she’d bring jars of sour pickles, kosher pickles and sweet pickles to family gatherings, adding her special zest to every meal. She’s a newshound: Aunt Elaine, a self-admitted liberal, watches the evening news and all the cable news networks (even Fox News, she says), switching between them to see how they’re covering the stories of the day. She’s a big fan of Rachel Maddow (“That Rachel is a smart cookie!”) and also of The Daily Show with Jon Stewart and Stephen Colbert (calling him “Cole-bert,” not “Col-bear,” as is his preference.) Some of what she sees in the news gets her fuming, and when that happens, she writes to her senator, to the media and to the National Republican and Democratic parties, depending, of course, on what’s got her peeved. Besides Aunt Elaine, I’m close to Beth, her daughter. Cousin Beth and I also have daughters of our own, both coincidentally named Sarah, who love spending time together whenever they can. For them, it’s all about family—and for them, I am family! So, divorce, shi-morse! We’re through with choosing sides! Your Aunt Elaine sounds like a lovely woman! It’s amazing how such rejection can hurt. I’ve experienced it too and it never gets easier. Oh, well, indeed. Thanks for sharing! Still married after 27 years, 17 of them happy, but I think you could accurately count the number of my ex-boyfriends by the number of my ex-boyfriends’ moms that I still love. Well, first I want to congratulate you on 27 years of matrimony. I find it uplifting to hear about couples who go the distance. And how wonderful that you have stayed connected to the moms of your exes. I have a friend whose son broke up with his longtime girlfriend not too long ago, yet she has stayed close to the ex-girlfriend, constantly singing her praises, and lamenting that her son didn’t marry her. Oh well, it’s nice to know we can find ways to remain close, despite the split. Thanks for checking out my blog! Here we go again with the similarities: I have an Aunt Diane. She is my ex’s aunt, and she is one of my favorite people. I’ve spoken with her many times on the phone post-divorce, and I plan to visit her soon in San Diego.